BOSTON, MA (October 24, 2013) – Brightcove Inc. (NASDAQ: BCOV), a leading global provider of cloud services for video, today announced financial results for the quarter ended September 30, 2013. "Brightcove delivered solid third quarter results, highlighted by 29% growth in total revenue combined with our first quarterly non-GAAP operating profit in the company's history," said David Mendels, Chief Executive Officer of Brightcove. "The shift to online and mobile consumption of digital media continues to accelerate and customers are looking for a flexible, robust and cost-effective platform that enables them to deliver a compelling viewing experience to their customers. As the leading online video platform, we believe Brightcove is well positioned to capitalize on this significant trend." Revenue: Total revenue for the third quarter of 2013 was $28.5 million, an increase of 29% compared to $22.1 million for the third quarter of 2012. Subscription and support revenue was $26.5 million, an increase of 23% compared with $21.5 million for the third quarter of 2012. Professional services and other revenue was $2.0 million, compared to $568,000 for the third quarter of 2012. Gross Profit: Gross profit for the third quarter of 2013 was $19.3 million, compared to $15.1 million for the third quarter of 2012, and gross margin was 68% for the third quarter of 2013. 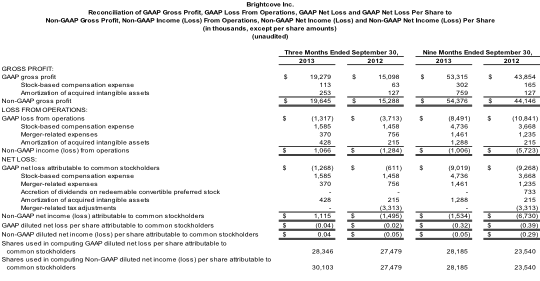 Non-GAAP gross profit for the third quarter of 2013 was $19.6 million, representing a year-over-year increase of 28% and a non-GAAP gross margin of 69%. Non-GAAP gross profit and non-GAAP gross margin exclude stock-based compensation expense and the amortization of acquired intangible assets. 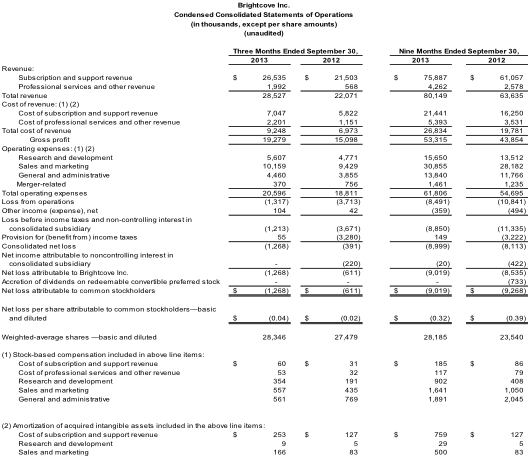 Loss from Operations: Loss from operations was $1.3 million for the third quarter of 2013, compared to a loss of $3.7 million for the third quarter of 2012. Non-GAAP income from operations, which excludes stock-based compensation expense, the amortization of acquired intangible assets and merger-related expenses, was $1.1 million for the third quarter of 2013, compared to a non-GAAP loss from operations of $1.3 million during the third quarter of 2012. Net Loss: Net loss attributable to common stockholders was $1.3 million, or $0.04 per basic and diluted share, for the third quarter of 2013. This compares to a net loss attributable to common stockholders of $611,000, or $0.02 per basic and diluted share, for the third quarter of 2012. Non-GAAP net income attributable to common stockholders, which excludes stock-based compensation expense, the amortization of acquired intangible assets, merger-related expenses and merger-related tax adjustments, was $1.1 million for the third quarter of 2013, or $0.04 per diluted share, compared to a non-GAAP net loss attributable to common stockholders of $1.5 million for the third quarter of 2012, or $0.05 per diluted share. 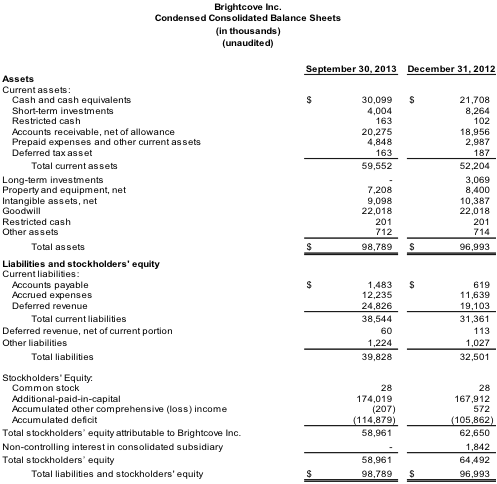 Balance Sheet and Cash Flow: As of September 30, 2013, Brightcove had $34.1 million of cash, cash equivalents and investments, compared to $30.5 million at June 30, 2013. Brightcove generated $4.8 million in cash from operations and invested $1.4 million in capital expenditures, leading to free cash flow of $3.4 million for the third quarter of 2013. Free cash flow was negative $1.4 million for the third quarter of 2012. A Reconciliation of GAAP to Non-GAAP results has been provided in the financial statement tables included at the end of this press release. An explanation of these measures is also included below under the heading "Non-GAAP Financial Measures." ExactTarget launched a new online video portal with a full library of live and on-demand content that can be viewed across all devices using the Brightcove Video Cloud online video platform. ExactTarget was also one of 35 customers who deployed our Live Module in its first full quarter of availability to live stream its Connections 2013 event that was held in September. Viacom launched Brightcove’s Video Cloud and native player app solutions to enable their second screen and TV Everywhere offerings by delivering high-quality, long-form video experiences to Apple iOS, Google Android and Xbox devices. EVS, a global provider of live video production systems, chose Brightcove’s Zencoder cloud-based encoding service to power transcoding for its C-Cast solution. The Company expects revenue to be $28.0 million to $28.5 million, and non-GAAP income from operations to be $350,000 to $650,000. Assuming approximately 28.7 million shares outstanding, Brightcove expects its net loss per diluted share attributable to common stockholders to be $0.09 to $0.10, which includes estimates for stock-based compensation expense of $1.6 million, merger-related expenses of $180,000 and amortization of acquired intangible assets of $430,000. Assuming approximately 30.9 million shares outstanding, Brightcove expects its non-GAAP net income per diluted share attributable to common stockholders to be $0.00 to $0.01, which excludes the estimated expenses referenced in the previous sentence. The Company is raising its 2013 financial guidance for revenue and non-GAAP loss from operations. Revenue is expected to be $108.0 million to $108.5 million, and non-GAAP loss from operations is expected to be $350,000 to $650,000. Assuming approximately 28.3 million shares outstanding, Brightcove expects its net loss per diluted share attributable to common stockholders to be $0.40 to $0.41, which includes estimates for stock-based compensation expense of $6.4 million, merger-related expenses of $1.7 million and amortization of acquired intangible assets of $1.7 million. Brightcove expects its non-GAAP net loss per diluted share attributable to common stockholders to be $0.05 to $0.06, which excludes the estimated expenses referenced in the previous sentence. Brightcove will host a conference call today, October 24, 2013, at 5:00 p.m. (Eastern Time) to discuss the Company's financial results and current business outlook. To access the call, dial 877-407-3982 (domestic) or 201-493-6780 (international). A replay of this conference call will be available for a limited time at 877-870-5176 (domestic) or 858-384-5517 (international). The replay conference ID is 10000434. A replay of the webcast will also be available for a limited time at http://investor.brightcove.com. Brightcove Inc. (NASDAQ: BCOV), a leading global provider of cloud services for video, offers a family of products that revolutionize the way organizations deliver video experiences. The company's products include Video Cloud, the market-leading online video platform and Zencoder, a leading cloud-based media processing service and HTML5 video player technology provider. Brightcove has more than 6,300 customers in over 70 countries that rely on Brightcove cloud content services to build and operate video experiences across PCs, smartphones, tablets and connected TVs. For more information, visit http://www.brightcove.com. This press release includes certain “forward-looking statements" within the meaning of the Private Securities Litigation Reform Act of 1995, including statements concerning our financial guidance for the fourth fiscal quarter of 2013 and the full year of 2013, our position to execute on our growth strategy, and our ability to penetrate our market and expand our leadership position. These forward-looking statements include, but are not limited to, plans, objectives, expectations and intentions and other statements contained in this press release that are not historical facts, and statements identified by words such as "expects," "anticipates," "intends," "plans," "believes," "seeks," "estimates" or words of similar meaning. These forward-looking statements reflect our current views about our plans, intentions, expectations, strategies and prospects, which are based on the information currently available to us and on assumptions we have made. Although we believe that our plans, intentions, expectations, strategies and prospects as reflected in or suggested by those forward-looking statements are reasonable, we can give no assurance that the plans, intentions, expectations or strategies will be attained or achieved. Furthermore, actual results may differ materially from those described in the forward-looking statements and will be affected by a variety of risks and factors that are beyond our control including, without limitation, risks associated with our history of losses, our limited operating history, expectations regarding the widespread adoption of customer demand for our Video Cloud and Zencoder products, our ability to expand the sales of our products to customers located outside the U.S., keeping up with the rapid technological change required to remain competitive in our industry, our ability to retain existing customers, our ability to manage our growth effectively and successfully recruit additional highly-qualified personnel, the price volatility of our common stock, and other risks set forth under the caption "Risk Factors" in the Company’s Annual Report on Form 10-K, as updated by our subsequently filed Quarterly Reports on Form 10-Q and our other SEC filings. We assume no obligation to update any forward-looking statements contained in this document as a result of new information, future events or otherwise. 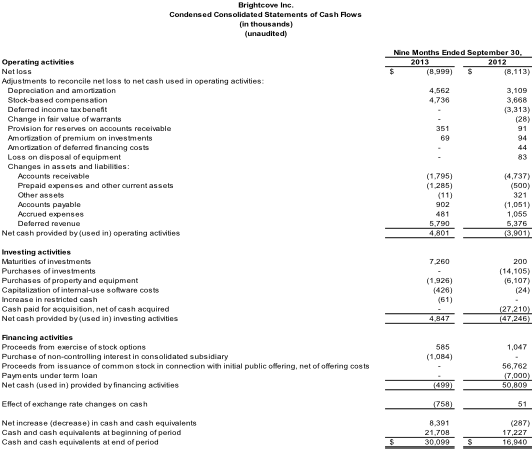 Brightcove has provided in this release the non-GAAP financial measures of non-GAAP gross profit, non-GAAP gross margin, non-GAAP income/(loss) from operations, non-GAAP net income/(loss) attributable to common stockholders and non-GAAP diluted net income/(loss) per share attributable to common stockholders. Brightcove uses these non-GAAP financial measures internally in analyzing its financial results and believes they are useful to investors, as a supplement to GAAP measures, in evaluating Brightcove's ongoing operational performance. Brightcove believes that the use of these non-GAAP financial measures provides an additional tool for investors to use in evaluating ongoing operating results and trends and in comparing its financial results with other companies in Brightcove’s industry, many of which present similar non-GAAP financial measures to investors. As noted, the non-GAAP financial results discussed above exclude stock-based compensation expense, the amortization of acquired intangible assets, merger-related expenses, the accretion of dividends on redeemable convertible preferred stock, and merger-related tax adjustments. Non-GAAP financial measures have limitations as an analytical tool and should not be considered in isolation from, or as a substitute for, financial information prepared in accordance with GAAP. Investors are encouraged to review the reconciliation of these non-GAAP measures to their most directly comparable GAAP financial measures. As previously mentioned, a reconciliation of our non-GAAP financial measures to their most directly comparable GAAP measures has been provided in the financial statement tables included below in this press release. The Company’s earnings press releases containing such non-GAAP reconciliations can be found on the Investors section of the Company’s web site at http://www.brightcove.com.